class="post-template-default single single-post postid-365132 single-format-standard custom-background group-blog header-image full-width singular wpb-js-composer js-comp-ver-5.7 vc_responsive"
Courtesy/ Governor Ricketts with (from left to right) Senator Suzanne Geist, Senator Mike Hilgers, NDOT Director Schneweis, and Senator Curt Friesen at the news conference announcing the accelerated construction timeline of the Lincoln South Beltway. Lincoln, Neb. 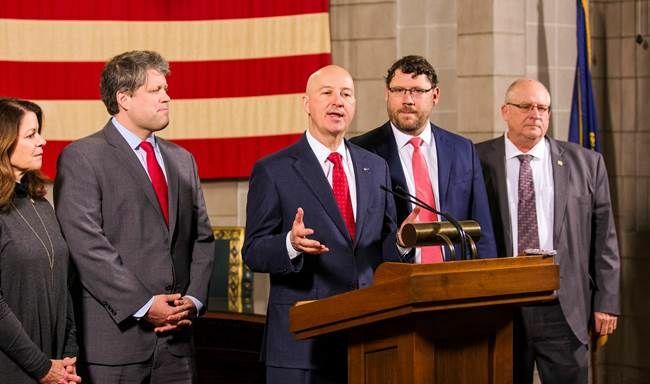 — Governor Pete Ricketts, along with Senator Curt Friesen, Senator Suzanne Geist, Senator Mike Hilgers, Lincoln Mayor Chris Beutler, and Nebraska Department of Transportation Director (NDOT) Kyle Schneweis, announced an expedited construction schedule that will allow the Lincoln South Beltway to be open to traffic by the end of 2022. Previously, construction was anticipated to take up to eight years to complete. With this new approach, the NDOT will begin construction in 2020 and traffic will be underway on the Lincoln South Beltway by the end of 2022.